A rather tasty treat if you're a fan of crumble! Cut thin top off apples, also cut thin slice off bottom of apple to make sure they sit even in your baking dish. Take core out of apples and also scoop out a little all around the top of the apple to make a well to hold crumble mix. 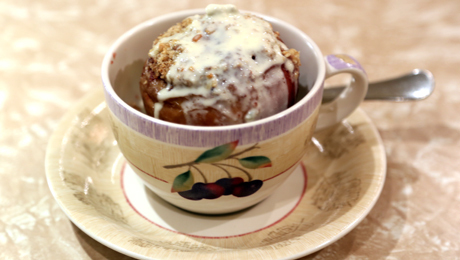 Fill centre of apple with Damson Jam, sprinkle with crumble mix and bake in oven at 200 degrees for 20 minutes until golden. While apples are cooking put cream and blue cheese into saucepan and heat until cheese is melted. Pour into serving bowl, cover to prevent skin forming. When ready to serve apples put a good dollop of blue cheese mixture on top. If you don’t like Blue Cheese just use pouring cream or custard or both.